Pleased to share news about Megan Knize (right), who today contributes a "Postcard from Palau," the Pacific island state where she's now serving as a Court Counsel to the country's Supreme Court. Megan joined our blog in 2008, via a post on counterfeit medicines co-authored with IntLawGrrl Kathleen A. Doty. At the time, Kate and Megan were a few months shy of graduation from the University of California, Davis, School of Law, where both were my students. Immediately after earning her J.D. degree, Megan practiced at the San Francisco law firm of Dewey & LeBoeuf and published her article, "Payday Lending in Louisiana, Mississippi, and Arkansas: Toward Effective Protections for Borrowers," in a 2009 edition of the Louisiana Law Review. She then moved to Southern California to become a judicial law clerk, 1st for Judge Carolyn B. Kuhl, in the Complex Civil Litigation Division of the Los Angeles Superior Court, and then for U.S. District Judge James V. Selna of the Central District of California. 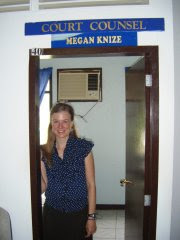 Megan also serves on the Board of Directors of the California Young Lawyers Association. Heartfelt congratulations on all these achievements!